Welcome to Day 4 of Migraine and Headache Awareness Month, folks! For Day 4, we have been asked “What large thing gives you hope for living with Headaches and Migraines?” Last week, this post would have taken a great deal of thought and I’m not entirely sure what the outcome would have been. However, my appointment with my new headache specialist on Monday changed all that. From my house in western Massachusetts, it takes about 2-2.5 hours to get to either of the doctor’s offices. A highly recommended neurologist with a specialty in both headache medicine and pain management seemed well worth the drive and he did not disappoint. You see, I have been seeing neurologists for almost twelve years now for my chronic intractable migraines and I have “outgrown” each neurologist. At some point in my treatment, the following statement always flies out of the mouth of whatever medical professional happens to be currently baffled by my lack of response to typical migraine treatments: “There’s nothing left we can do for you.” While I understand and accept that there is currently no cure for migraines, I do not accept that my migraines cannot be better managed nor do I accept that my quality of life cannot be improved. It is at that point that I am forced to move on, in search of someone who will partner with me on this journey, who hasn’t given up on me yet. It was immediately apparent that this new neurologist, whom I’ll call Dr. X, was different from the other neurologists I had seen in the past. For starters, he came highly recommended by patients and colleagues alike. 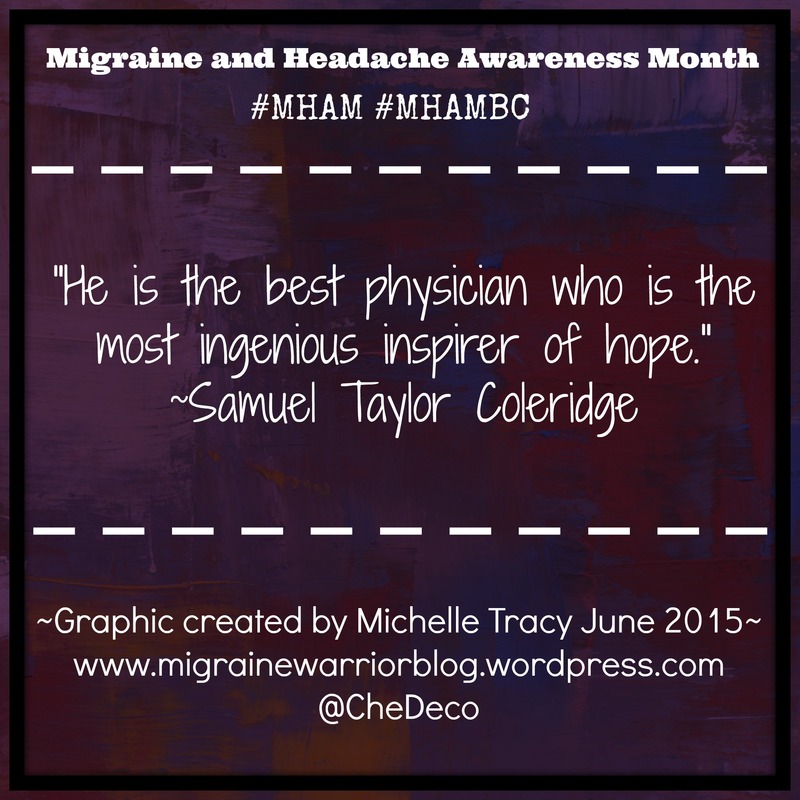 He is also highly active in both the migraine and cluster headache communities and has a great deal of interest in the subject of headache medicine. None of my previous neurologists seem to have even a mild interest in the subject (even the fancy-schmancy migraine specialist that I waited nine months to see!) Which brings me to my third point: Dr. X saw me in his office within a month of my referral. I could not even get in to see my current neurologist on such short notice! So, right off the bat, Dr. X had scored major points with me and my family. Upon reaching Dr. X’s office, he came into the waiting room, greeted me by name, and ushered my mother and me back into his office. Did I mention that we had arrived at my appointment early? Dr. X asked me many questions and it quickly became evident that he had gone over my history before I got to the appointment. (This sounds mundane but you would be surprised how many doctors are completely unfamiliar with my case when I end up in their offices.) Dr. X spent over an hour conversing with my mother and I and only briefly stepped out to take a call from the hospital with which he is affiliated. My mother poked me and whispered excitedly “I LOVE him! He actually has a personality!” It was true. Dr. X was funny, well-informed, passionate, and more than capable. However, it was what he said near the end of my appointment when I finally understood what set him apart from the rest of the doctors I had seen. “Everything is on the table right now. There are lots of things for us to discuss and try,” he said. I blinked back tears. “All of my other neurologists have told me that there was nothing left that we could do. They told me that we were at the end of the line,” I replied. I am so happy for you. You must be over the moon cause I feel like jumping up and down for you. I look forward to hearing about your progress. My specialist said he couldn’t help me anymore, and that was it. I wish I could find someone like you have found. Perhaps we need to go and see her specialist. Kirsten, I urge you to keep looking. I don’t know how far along you are in your migraine journey but this marks year 12 for me and this is the first neurologist/headache specialist that I’ve really felt could help me and seems to be not only interested in headache medicine but also passionate about advocacy, well-informed, and more than competent. Don’t give up hope. I feel like I am over the moon and back again! I’ve learned to be cautiously optimistic but I truly think he has the right approach to treating me and is willing to view me as a partner as well as a patient. Thanks for the kind words!